A traditional puppet theater from Liège will delight the youngest among us. The "Théâtre Mabotte" brings together professionals who perpetuate this old tradition with talent. Brilliant! So come and join them ! Ephemeral pieces of art on the most beautiful artworks of parents, time for children to play being someone else ! 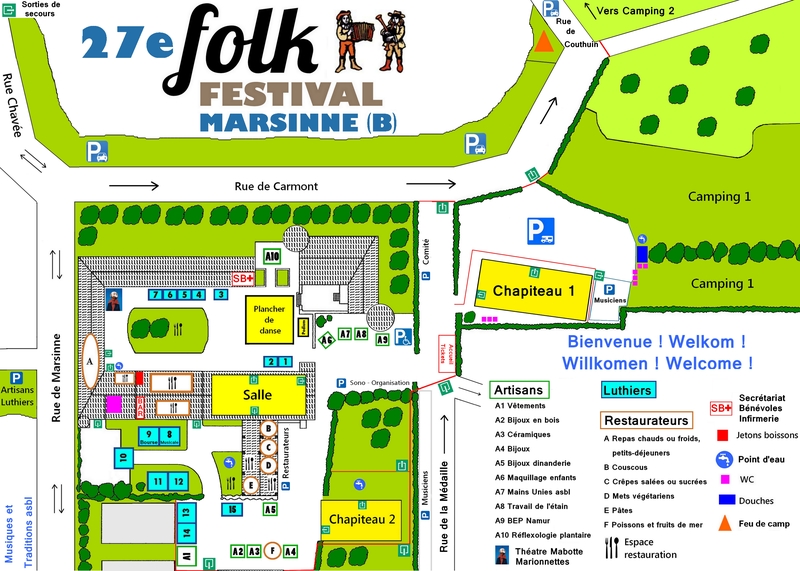 Two reliable musicians, André Deru et Thierry Legros (from the band Salon Ambroisine), propose a musical market in Marsinne. Do you wish to sell a musical instrument ? Confide it to this stand for the day (taken back at 6:30 pm at the latest). Indicate the asking price or / and a mobile phone number where the potential buyer could contact you. André Deru and Thierry Legros will welcome the instruments with the biggest attention and will take care so that these objects undergo no damage. However, they cannot be held responsible in case of damage or theft. do you wish to buy a musical instrument ? Pay the asking price or, if necessary, contact the seller. Animation for child (4€) between 14:00 and 16:00, child carries the piece he made with his name engraved on it.